This twenty-fifth issue of Tales from the Canyons of the Damned consists of four sharp, suspenseful, thought provoking short stories-each from a different featured master of speculative fiction. Exodus Sol—P.K. 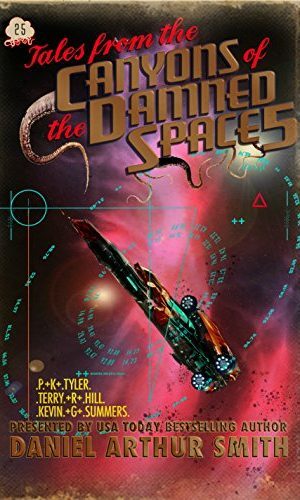 Tyler Deep Throw 1—Terry R. Hill Brethren—Kevin G. Summers Off-World Kick Murder Squad V—Daniel Arthur Smith Tales from the Canyons of the Damned (canyonsofthedamned.com) is a dark science fiction, horror, & slipstream magazine we’ve been working on since 2015. What is Dark Science Fiction and Horror? Think of it as a literary Twilight Zone, Night Gallery, or Outer Limits, it’s Netflix’s Black Mirror and Amazon’s Electric Dreams in the short story format. And it’s a bargain. Each monthly issue has three-to-five sharp, suspenseful, satirical tales from today’s top speculative fiction writers. These are Dark Sci Fi Slipstream Tales like you’ve never read before. P.K. Tyler’s “Exodus Sol” – Castor is stationed in deep space when disaster strikes and terrorists attack. Believing that the government is trying to control Earth’s expansion efforts, Castor is a part of the Emergency Response Team caught up in this fracas and pulled in both directions. What will he choose when confronted with two opposing points of view? Castor struggles through the action in a series of harrowing encounters that challenge him morally. Also, the twists and turns of this tale gave me whiplash because of how surprising they were. It’s a powerful and riveting tale with a shocking ending.